doing with Gaiman–couldn’t find the last one. Actually the thumbnails to Chloe and the Lion. 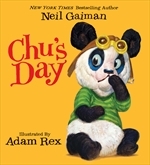 Couldn’t find the thumbs to Chu’s Day, either. Should I have made a “panda thumbs” joke here? Because pandas have thumbs? Maybe it’s a little too on the nose. 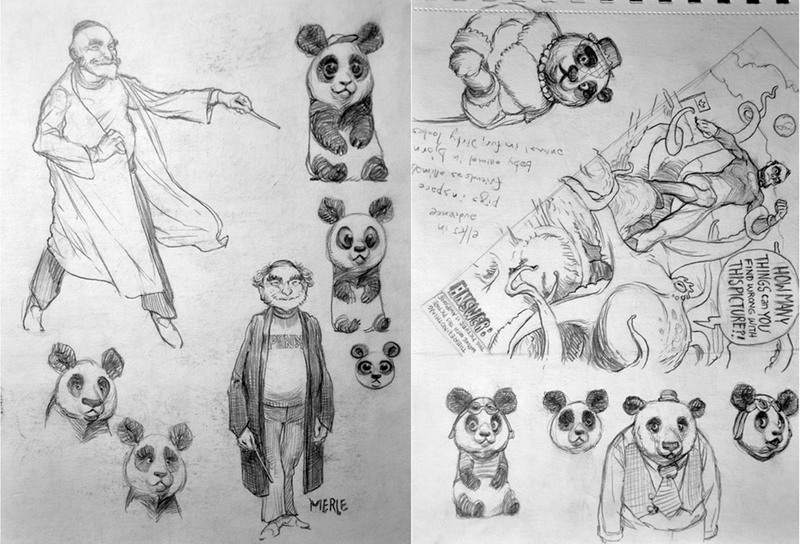 Once I have all my pandas in a row I probably sketch character designs. This is easily my favorite part of the process, when everything’s still new and the book in question is still the best thing I’ve ever done or will do. Now’s when I start entertaining comments from the editor and art director, and make changes, and fight for things I don’t want to change. I don’t remember there being much disagreement over this particular book, though HarperCollins didn’t care for the way I was treating the text in my pdf. They nixed the CMY bubble-things, and hired a letterer so I wouldn’t have to worry about that, as I was already several months late at this point. At this step I consider why I fail to meet deadlines, and why I’m such a constant disappointment to all who depend on me. You may want to skip this step, but I can’t seem to. Anyway, you can guess the rest. Once the editor and I agree on everything, and the author either likes it or else the editor decides the author is wrong for disliking it and therefore doesn’t tell me, then I finish the illustrations. I render the finishes a little differently on each book. About halfway through I’m so sick of pandas I’m actually glad they’re endangered. When I turn in the art I’m worried that it’s totally inadequate. When the book arrives in stores a year later I only see mistakes. A few months later I love it. *It’s been pointed out to me that a small number of 24-pagers exist, so I was wrong about this. I still advise people new to the field to aim for 32-page PBs, or 40-pagers, because a publisher can’t typically price a 24-page book as high. So you’re probably not saving them any money by going shorter. **I end up discussing this a little in the comments, if you’re interested. THAT is such a delightful post and fabulous bunch of images, Adam! You tell it like it is, with aplomb. There….I used a word that's not usually usable. I kinda thought you might like that. Anywaaaaay…..your work inspires me to go after ideas and also to draw much more!! Thanks for sharing and being so candid, Adam! 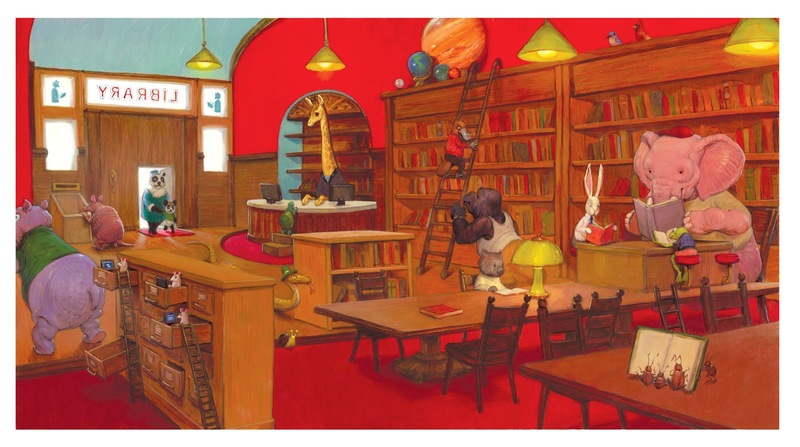 I love the illustrations in kids' books and often wondered about the process behind getting the product together, it's actually pretty close to what I thought it would be (apart from the Abe Lincoln drawing, which is awesome). Love your work, those pandas are darn cute! Great post! Can you give us a rough time frame for this? Is the whole project x amount of months, or is each phase a specific amount of weeks? 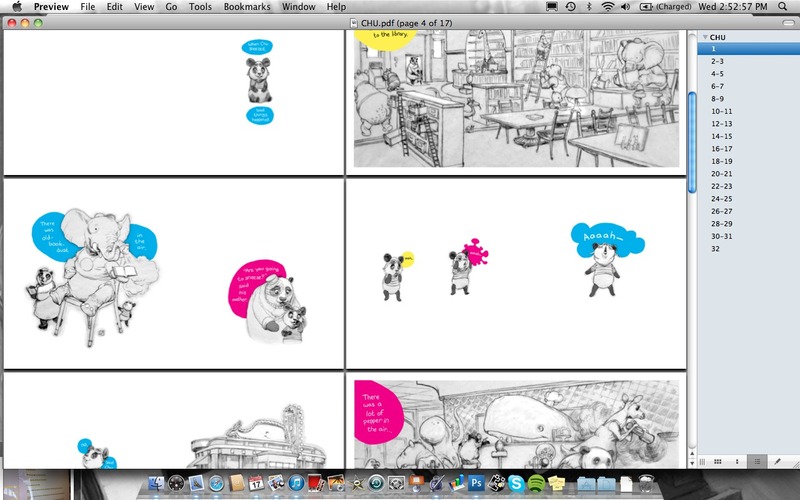 And, if you are still feeling share-y, those thumbs and roughs are gorgeous, how long do those badboys usually take? This book looks beautiful. I would have kept the CMYK balloons. Great stuff Adam. It would be interesting to see how the process differs with your own story. I only did one book, with my own story, and the process seems very similar once the manuscript was nailed. Always the manuscript. The lines in your sketches are so lovely and dark. What kind of magic pencil do you use? Or is that just an effect of the scan/photo? I really enjoy your work. Thanks for the great post Adam. An amazingly insightful post. Thanks so much for sharing your process. Thanks for this very honest peek into your process. Lovely sketches and finishes, (I also loved the CMYK bubbles! ), and your comments about self-doubting moments are the human bits that we so often feel we're the only ones that experience and so pretend to the rest of the world that they never happen. Love it, and the book looks adorable! CMYK me inspired. Thank you for writing this blog post. You have helped me a lot with the “where to Start” on my own picture book project. Also, I loved the idea of using CMYK word bubbles. Great idea and design element. I and many others like me will probably end up steal this idea for our own means. It's hard to gauge time because there's always some waiting built in–waiting for comments and so forth–and also because I'm usually working on at least one other thing at the same time. But I usually tell people that I can work on about two PBs a year, or one PB and one novel, before I have to really start sacrificing either quality or free time. I probably spend a day on the roughest thumbnails, and if I really know what I'm doing I can dummy up the whole book in a couple of weeks. You know, it's probably not all that different when it's my own story. I still don't do much sketching until the manuscript really feels like it's in the can. Probably just the scan. I think I'm usually just using an HB lead. I'm planning to steal it myself on a future book. We'll see if THAT editor and art director likes it. I also liked the CMY balloons. The final was still wonderful though. I appreciate these inside lane posts. It shows that that there are so many slight variations, and yet still some important fundamentals to this process. It's a good question. I ALWAYS made my deadlines back when I was just doing small work-for-hire assignments, and I think that was greatly appreciated. 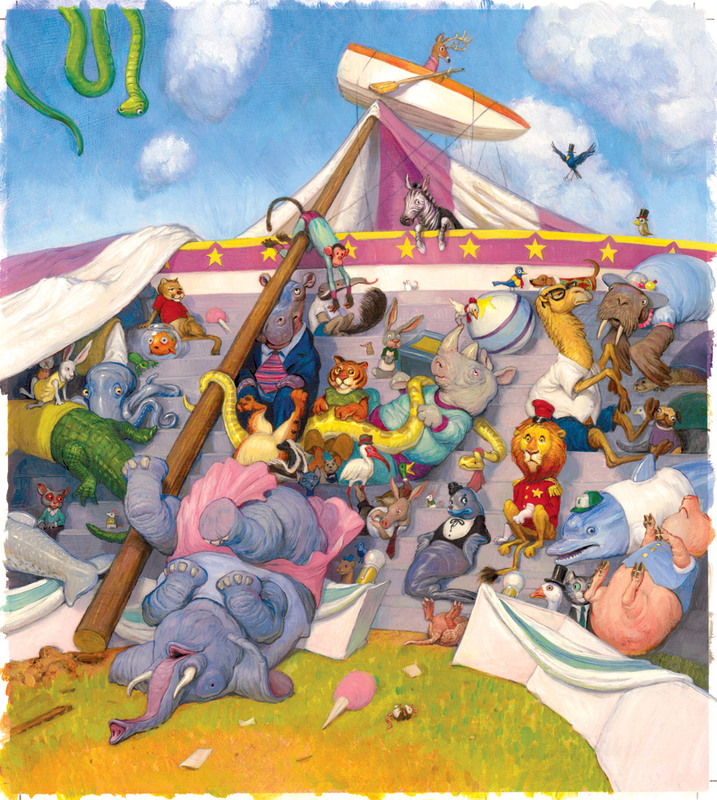 It's been my experience that deadlines are a little more fluid in the kid's book world, but I'd still never tell anyone to blow them off, especially on their first book. Communication is often as important as meeting deadlines, so don't be like me: I tend to underestimate how long I need on a book, and agree to an unrealistic due date to make the editor happy; then I put off telling her that I'm going to be late because I don't want to disappoint her. It's like I'm still nine. Aplomb! You just dropped an A-plomb right in the middle of that sentence. On my finishes? These are oils on top of a print of the digital color rough. Still a multiple of the 8 page signatures for printing, and usually they are paperbacks, but not always. I love reading all this process stuff. And, for what it's worth, I really want to know more about how you decide how to break the text into pages. This was quite interesting. I too enjoyed your sense of humor, but I also liked your technical perspective; nice balance. Informative and so much fun! I'm wondering how the process is different with books that are your own text. Did the pictures come first? I'm sorry not to really have an answer to your question. So far I've just selected trim sizes based on what I wanted to do and what I thought the book needed. Then the art department at the publisher has sometimes asked to modify the trim size somewhat, and that may be for financial reasons. But I haven't paid enough attention to this step to notice if here was a pattern. Regarding aspect ratio, I choose based on what makes sense to me, so I don't really have a favorite. 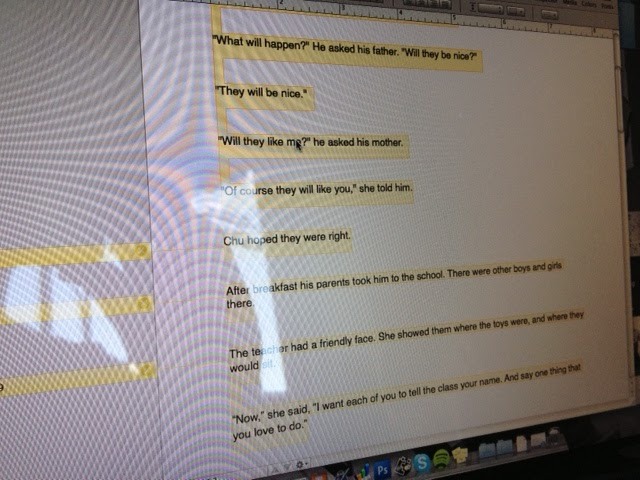 On a book I did in which a boy is given a blue whale to keep as a pet, it seemed crazy not to use a landscape format. On this book about a small and cute panda, I went with dimensions that were a little smaller than your average PB and made it square, because…I think squares are cute, I guess? If the instinct when designing cute characters is to make them as round as possible, then the square is the circle of the rectangle family. Hi Adam, great process post! I was hoping you could elaborate on your “there are a lot of tricks for getting to the right page count, and not all of them are obvious” statement. Do you mean self-ended books vs. endpapers, half-titles, etc? I'd love to know what your tricks are! A very nice post on this Adam. It helped clear up some things for me on the latest book I was working on. 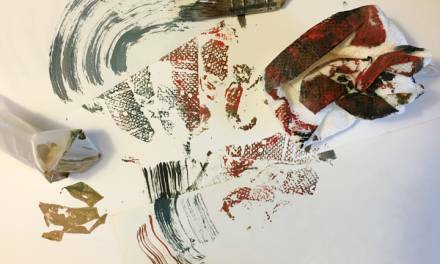 “When I turn in the art I'm worried that it's totally inadequate.” < --- STORY. OF. MY. LIFE. :D It's one of the worst debilitating feelings I have towards the end of most of my illustrations, but I have seen it crop up more and more as I work on books and various comic stories.Thanks so much for the insight and thoughts on this. For the record, your artwork is superb, such a wonderful relaxed flow to the characters. How big are your paintings and how are the digitized….scanned or photographed or etc???????????? I just picked up a copy of Chole and the Lion at the Western Washington SCBWI conference. Mac was kind enough to sign it. I was worried he might press charges since I sort of stalked him. But he didn't. He even added a lion. Which was nice. Seeing the thumbnails here for that was a treat. Thank you for sharing that! I really enjoyed your illustrations and characters, and felt that you were much more suited for the job than Hank Blowfeather, regardless of what Mac said. So nice to see how similar and different everyone's process is. My husband read the last two frames and now thinks we are ALL crazy. I think it makes him feel better that it's not just me! Yeah, my friend Brian Biggs pointed out to me that he's done several in a series. So I'm wrong, but I'd still advise neophytes to aim for 32 or 40 pages. Publishers can't typically price 24-pagers as high, so they may be reluctant to publish them. Brian's books were something like 12 dollars instead of 17. For me it's still typically text-first. Yeah, it sounds like you know what I was talking about already. But sometimes a book's endpapers are of the same paper as the rest of the book. This is a “self-ended” book, and the endpapers count. And here's the weird part: in such a book, the first page is the one that's pasted face-down against the board. The second page is the first visible (yet still un-flippable) page, and so on. The last page is similarly pasted face-down against the back board. William Joyce once even printed the copyright info on the endpapers of a SEPARATE-ENDED book. I guess he needed the space? I've never seen anyone else do this. Great to see a process post … the best bits were your hilarious asides! Okay you can add one more fan to your list! Thank you! Thanks so much for posting this. I'm writing + illustrating my first picture book at the moment and find it the toughest process to uncover what i have already in my head. 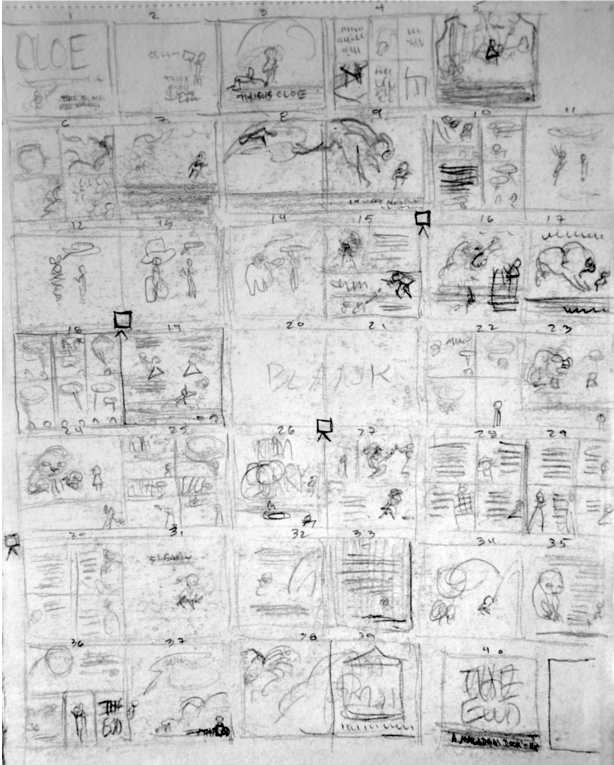 i wrote the manuscript but once in storyboard-land i noticed how badly my story flows from an entertainment point of view. So i feed back from my storyboarding into my script and seem to be able to give important story elements better breathing space. When you work on your own content how do you make sure your story and the visuals are always as simple and as accessible as possible for such a young audience? I enjoyed this post. Thanks. 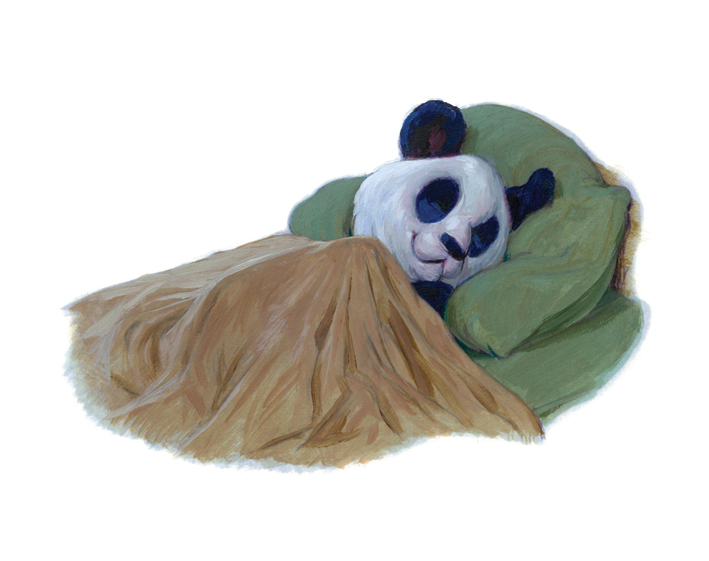 A sleeping panda is a nice thing. On my first PB I worked pretty large–something like 300% of the printed size, I think. On this panda book I actually painted at the printed size. I have small brushes. I think the publishers typically have them scanned rather than photographed, but I'm not actually privy to this step. Hmm, I'm not sure. I'm afraid it might be largely instinct. I alternated big, busy compositions with some very spare vignettes and a lot of white space so as not to make the imagery overwhelming. 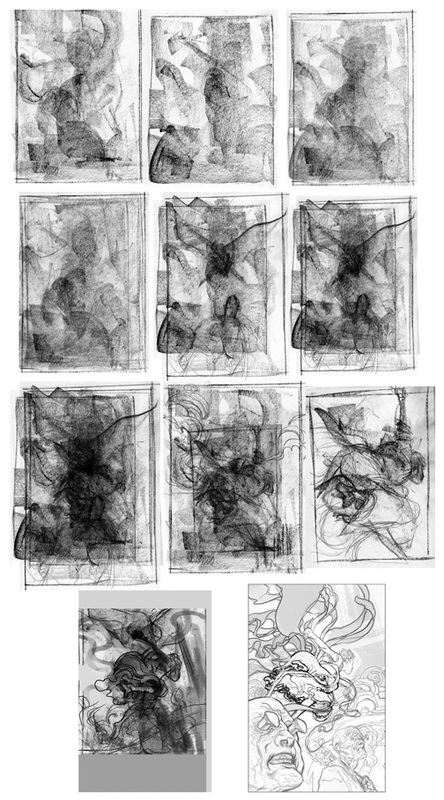 I also find thumbnails valuable because I can determine if a composition seems legible to me even at a small scale. In this digital age it can be valuable to look at your images at a very small size, and maybe even in black and white, to see if they still work. It's suddenly really important to me that I use the phrase “the square is the circle of the rectangle family” during a conversation tomorrow. Thanks for that! That's very good advice! also shows me i'm on the right track. i love having everything on one page to constantly see the whole picture. i keep it black and white probably until i lock the story down. The scaling smaller works a treat! I also found it great to flip and flop the whole board regularly. Thanks for this fascinating and hilarious post. I'm gonna print it out and staple it to my forehead — maybe then all the cool bits will sink in. Wish you still lived in Philadelphia: I got to see your 'Dirty Cowboy' paintings at the City Hall exhibit. Woohoo. That was a great post! It was good to read that someone of your talent and caliber has doubts when submitting the final art. Bwahaha! My favorite line: “About halfway through I'm so sick of pandas I'm actually glad they're endangered.” Thanks for the glimpse into your head. 😛 Great post. I was surfing the net, taking a break from the paintings I'm doing for a book about a crazy Toucan, which was supposed to be the best thing I'd ever done or ever will do, but which is currently looking woefully inadequate and is two months late, when I found this post. I feel better now. Though I still want to ask the publisher if there's time for me to start over. And Toucans should definitely be wiped out. Deeply envious of you and your amazingness. Don't get me started on toucans. Want to punch them in their stupid beaks. Thanks so much for the whole post and for this answer. You're filling in little holes in my understanding of picturebooks. Totally loved seeing this process! Frogs *are* massively endangered, though! Oh man, I've been wondering how you were doing it ever since Tree Ring Circus. What kind of paper do you use? And do you coat it with anything between printin' and paintin'? We used to read English books online but never think how it build..loved to see all this process!! Hello, thank you so much and congratulations on the illustrations, they are very nice. I have a small doubt. When you scan the originals, what are the characteristics of the scanner? 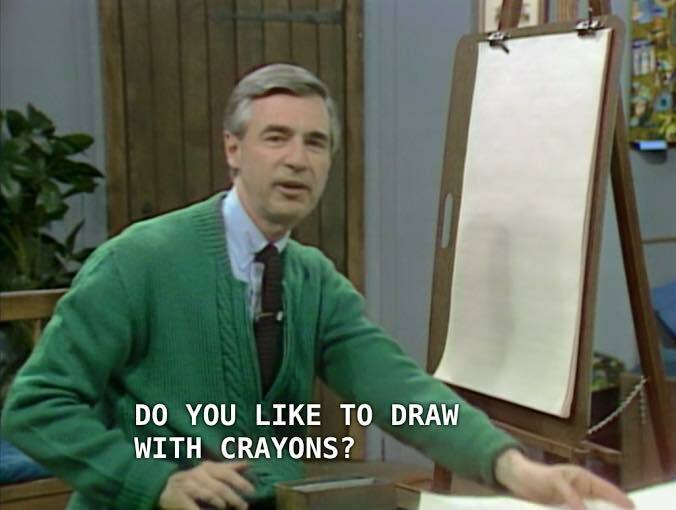 I ask this, because i see you have a lot of color, strong color, and i do to. But i am having a problem scanning them properly. 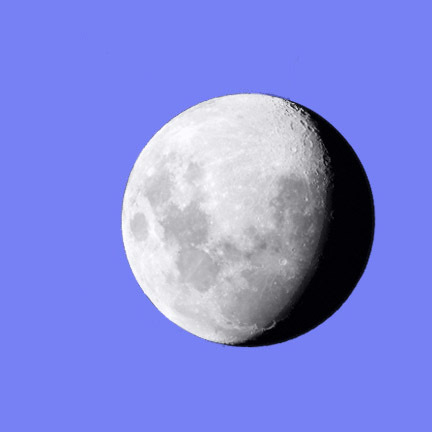 Either the colors have a high contrast far from the originals, or very low intensity. In both ways, i can't manage to fix them to the original state i draw, not even in Photoshop, so i am struggling. Thank you so much for sharing this excellent info! Looking forward to reading more! I had a plomb once, but my teacher told me it was inappropriate to have one in school. A very informative post, thank you! 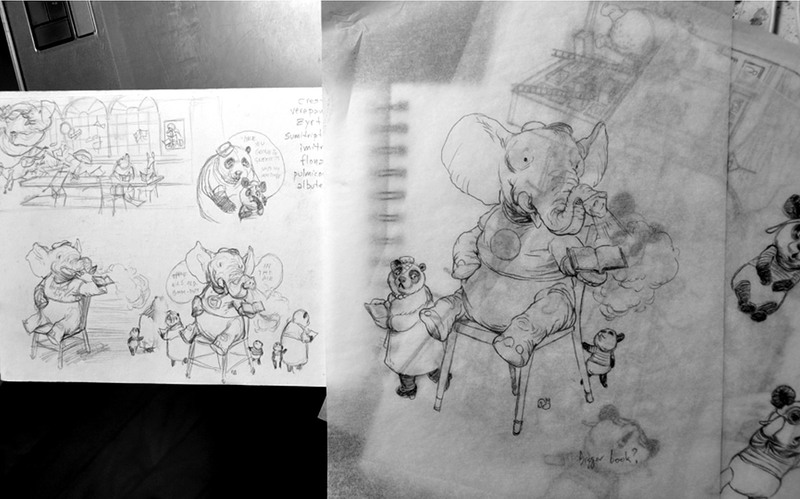 I have a question – do you make all your picture book drawings (the final ones) on tracing paper? This is awesome. This was my daughters FAVORITE book when she was a baby, I remember tweeting to Gaiman the video of her achoo-ing. I bought it because the art was beautiful. Thank you so much for sharing!